On the way back from Nishat Bagh, I made it a point that we stop at Ishber. I knew the spring was around Nishat somewhere. The place is also called Gupt Ganga or the Hidden Ganga. Somewhere near the place is the ashram of Shavite saint-scholar ‘Lal Sahib’ Swami Laxman Joo. The hosts of Yagnopavit function that night two decades ago had lived at Nishat. We had driven to the place in a car. Driver of our mini-van said he knew the place. It was night by the time we had reached the spring; in the darkness I hadn’t been able to fully appreciate the spring. All I could see of the spring that night was oil lamps lit around the periphery of the spring, and then set afloat in the waters – yellow light reflecting on dark waters. I was sort of disappointed. Maybe I had expected it to be like Mattan where my Nani had taken me sometime back. A water body at night is an entirely different entity. In-different. The only thing that got my attention was that I was told there a Shivling submerged in the spring and that one could see it. Too bad it was already night. It was evening by the time we reached the place. To my surprise the van stopped in front of a big rusty old iron gate of a Security Camp. The spring now falls inside the secured zone. This is the place. You have to go in, Driver said. Not everyone was excited about visiting the place, some stayed inside the van while we walked to the door of the camp. Young ones came along. We are Kashmiri Pandits. We are here to see the spring. The Talaab. You are here to see the temple. Any Identify proof? Id? Do you have any id proof? I was about to take out my pan card but my uncle intervened. He is just a kid. Here take my driving license. Okay hai? My uncle had got a driving license in Jammu. I remember Nanu driving a green Atlas cycle in Kashmir (which didn’t make to Jammu) , I remember him learning scooter, a creamy blue colored Chetek left every winter at our house by Badi Bua’s husband. The scooter reached Jammu, even though it was for a time being in the early 90s held captive by a gent named Mustaq Latram, one of the three released in exchange for passengers of the Indian Airlines plane IC 814 in 1999. I remember Nanu learning to drive Maruti 800 of his cousin brother who wasn’t actually his cousin but the youngest son of his step-brother. That night two decades ago it had been the Yognopavit ceremony of this cousin. Standing in front of the gate, I must have been just as old as my Uncle must have been in 1990. The man finally gave a smile and welcomed us in. The door opened. Maybe it was a bad idea. There were trucks parked to the left of the road, the end periphery of the camp and some Khaki colored tents up-ahead. Men in white undershirts, Khaki uniforms and hard black boots. Then I saw it, towards the right, in a depression, the spring identifiably by the classic two-tank structure for the Kashmiri spring temple. The source of the water along with the deity is enclosed in the higher smaller tank, and from this smaller tank, through little doors, the water flows out into the outer larger tank. The state of the tank was sad. Green with live algae and brown with dead water. There was already something unsettling about the fact that it now falls within the camp area. It seemed that the Spring, with its painted canopy for the smaller tank, was almost encroaching upon the camp land. It looked out of place. Or may be it was the other way around. It was disappointing. Then I remembered the story about the Shivling. I told others about it too. I had to see it. We walked to the boundary wall of the small high tank and looked in. There must have been about 5 feet of water inside the tank. With the waning light of evening, the view inside the tank wasn’t very clear. The Shiving had to be here. Then I saw it. Just below us in the top left corner of the tank we could see the Shivling. I pointed it out to the others. Everyone was surprised to see it. So it was true. But then doubt crept in. The shape we were looking at looked suspiciously unlike a Shivling. It looked more like a fountain from Shalimar, but it was stone grey or an inverted flower vase or an ancient stand for a flagpole. It sure wasn’t a Shivling. The light was fast waning, soon it was going to be too dark to see anything. My camera battery had already died which meant I had managed to take only one shot of this place. Others were getting anxious. Soon the sun will set, we have to get out of here, there are people outside in the Van waiting for us. It was all becoming one big disappointment. If only I could see that Shivling. Just them a security man walked up to us, smiling. Baba kay Darshan karnay hai? Wo yahaan hai. He pointed the direction, a bit off to the left and top of the center of the tank. A definite shape emerged from the dark still water. There it was right in front of us. The Shivling. Pandits of yore certainly gave a thought to the theatrics involved in worship. And they liked to build the most interesting theaters using the simplest of props. All they need was the right location. 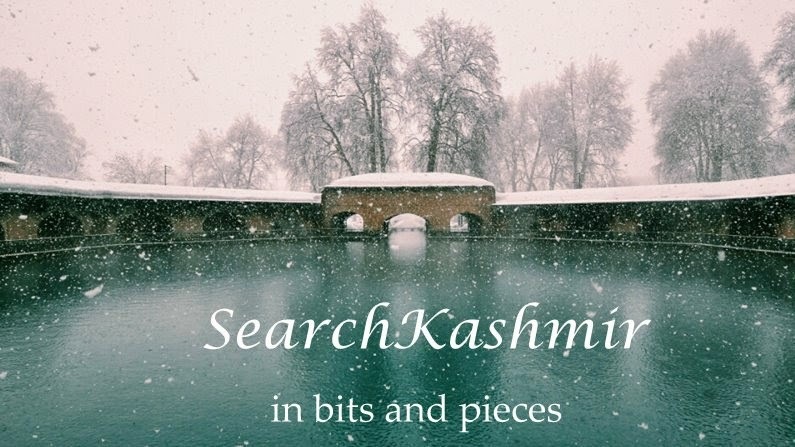 A lot of western visitors had noticed how the best of the locations in Kashmir, and the best of the springs were the site of a Pandit holy spot. The security man asked if we were not going to visit the new temple. There was a Mata temple in site the camp. People moved inside the camp to have the darshan, I loitered around the spring, the camp and then walked out. I turned indifferent around 10 years ago. Indifferent to Ishwar. As I walked out of that iron gate and towards the van, I witnessed a strange scene. A big curious crowd had gathered around the van. Mostly middle aged men and young children. Faces alive. Everyone from the visiting party was sitting tight inside the van, a bit jittery and trying not to look outside the window. Night was approaching. Where are others? We need to get out of here. Are the kids with them? I didn’t asking any questions. Soon we were out of there. I have released that the old guard of pundits does not melt at these testimonies of brotherhood. It is true. Hearts don’t melt. Doves don’t fly. Tears don’t roll down the cheeks in-sync. And even when they do, even if you retort with, 'Some of the Hindus are Pigs too', it don’t matter. But the use of word Khanzeer by a Kashmiri Muslim certainly got their ear, even if for a brief moment. 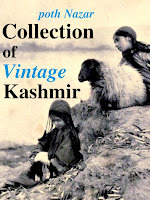 strange sense of nostalgia.. reminds me of the Kashmir (tempted to say cashmere) I have tediously created in my imagination!